For me, finding new and different ways to cook ribs mostly means finding a new sauce or glaze to use on the ribs themselves. Since I am limited to just the use of my oven, I don’t have the options of a gas grill, charcoal grill or smoker at my disposal to use different methods to bring out different flavors. When I saw this recipe for Alton Brown’s backyard baby back ribs, I knew I wanted to try it, but I didn’t have the backyard methods to use like he does in the recipe. 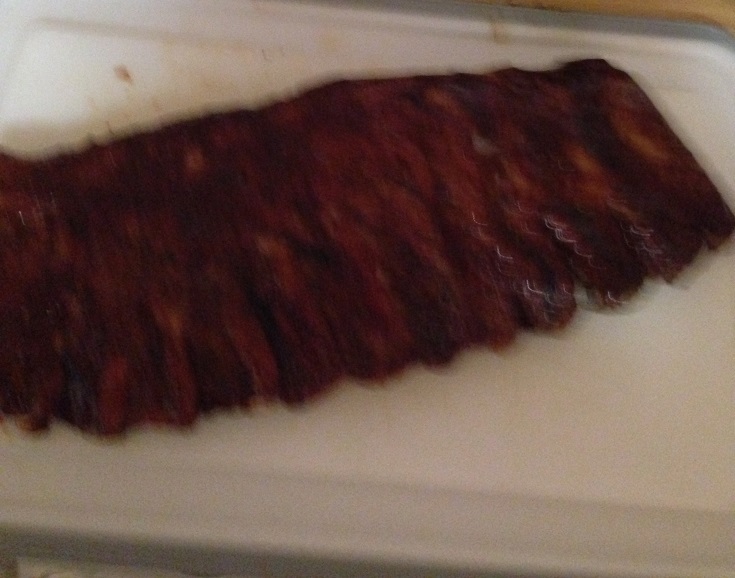 I also didn’t have any baby back ribs on hand; I only had some St. Louis spareribs in the freezer. I really liked the sound of the rub and the marinade on the ribs however so I decided to adapt it for my purposes. I’ll show you the original recipe here and then tell you what I did to change things around after. Place each rib rack on a sheet of extra-wide, heavy-duty aluminum foil. (The foil should be 4 inches longer than the ribs on either end.) Season the rib racks liberally with kosher salt and sprinkle each rack with 3 tablespoons of the rub. Turn the ribs, meat side down, and tightly seal each foil pouch. Place on a half sheet pan and refrigerate the ribs overnight. The next day, heat the oven to 250 degrees. The fat in the braising liquid will have solidified on the top and can be removed at this time. Transfer the liquid to a small saucepan and add the honey, ketchup, Worcestershire sauce, espresso powder and cayenne pepper. Whisk the ingredients until they are well combined. Set the saucepan over medium-high heat and reduce the mixture to a glaze, about 10 minutes. Set a gas grill to medium-high and allow it to heat for 10 minutes. Cut each slab of ribs in half and place them on the grill, flesh side down, close the lid and decrease the heat to medium. Leave everything alone for 3 minutes. Flip and cook the ribs for another 3 minutes. Flip and cook the ribs for 3 minutes on each side 1 more time or until each rib has a nice char. Remove the ribs from the grill to a cutting board. and cut the slabs into 2 rib portions, using kitchen shears. Add the ribs and half the glaze to a large serving bowl and toss the ribs to thoroughly coat them. Serve the remaining glaze on the side. For the rub, place all of the ingredients in an airtight container and shake to combine. Store for up to 3 months. Really the only change I made in the recipe comes in the final step. I heated the glaze in a small saucepan while I baked the ribs in a 375 degree oven for 25 minutes. I then glazed the ribs, turned the heat up to 400 and baked them for another 15 minutes before glazing them a final time and putting them under the broil for 2 or 3 minutes to get the char on them. Keep in mind I was using the St. Louis ribs, which are thicker and larger than baby back ribs, so they do take longer to cook through properly. It may not turn out the same as it would with a gas grill, but the ribs were still cooked well and tasted great. I really love the glaze and although I was skeptical with the use of the margarita mix in the whole thing, it did work quite nicely along with the orange juice, honey and the espresso powder. I would certainly give these ribs a try again. I apologize for the fuzzy picture; I didn’t realize it had not turned out well and didn’t take another one, but trust me, they are good! This is a great recipe. I love Alton Brown, he has some great recipes and methods. Such a fun show to watch. Thanks for sharing. I love his recipes too. He very often has great methods of making things and they come out perfectly. He’s certainly one of my favorites. Thanks for the comment! I make a simplified version that involves beer in the pouch – I didn’t know alton used oj – might have to try that 🙂 my husband and I have “rib offs” and he cooks on charcoal and I cook mine in the oven then finish on broil or on the propane grill and they always win ! I like the idea of trying it with beer. I’ll have to try it out and see how it does. Thanks for the comment and the idea Amber!